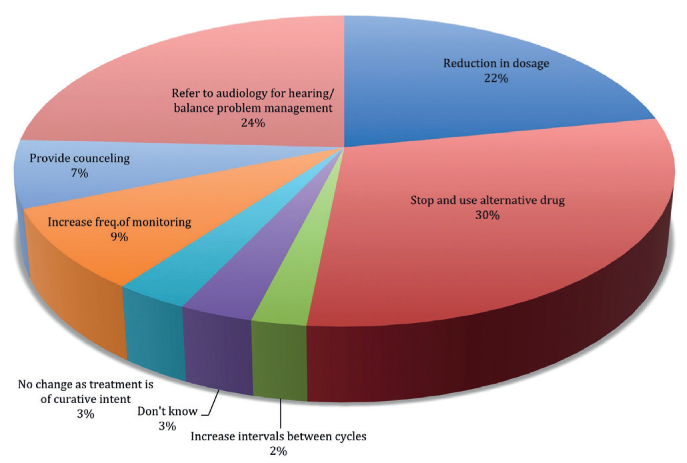 In this article Ghada Al-Malky explores the dichotomy of life-saving, yet hearing loss-causing medication, and questions whether the hearing healthcare community is doing enough to prevent preventable hearing loss. Ototoxicity is the damage to hearing and / or balance functions of the ear due to exposure to drugs or chemicals. There are over 200 prescription and OTC medications that are potentially ototoxic (Table 1) but the most well-established categories of drugs commonly associated with permanent irreversible damage to hearing / balance are antineoplastic agents such as cisplatin, and aminoglycoside antibiotics such as gentamicin, tobramycin and amikacin. When administered systemically, these medications usually lead to tinnitus, bilateral progressive high-frequency sloping hearing loss with subsequent difficulty hearing speech in noise, and / or symptoms of bilateral vestibular hypofunction, such as oscillopsia and general postural instability with a higher risk of falls, especially when vision and proprioception are comprised as well. The World Health Organization (WHO) has identified ototoxicity as one of the main preventable causes of deafness and an outcome that can be most directly influenced by healthcare professionals. However, the use of some of these medications cannot always be avoided as the benefits of these drugs in combating life-threatening diseases, such as cancer, TB, cystic fibrosis, endocarditis, post-dialysis peritonitis, sometimes outweigh the risks. Regrettably, ototoxic hearing loss often goes unnoticed in the early stages. With the basal turn of the cochlea (high frequency) affected first, it is often the case that patients only begin to report communication difficulties once the middle / apical (mid-low frequencies) turns of the cochlea become affected. At this stage, permanent damage has already taken place. Comparably, by the time a patient complains of imbalance, permanent vestibular damage undoubtedly has already occurred. Additionally, unlike nephrotoxicity, symptoms of ototoxicity are poorly correlated with drug dosage, peak serum levels, and other toxicities; therefore the only way to detect ototoxicity is by directly assessing auditory and vestibular function. Ototoxicity monitoring is also essential to provide early evidence of ototoxicity, in order to allow for changes in therapeutic management to be undertaken to prevent further deterioration or provide rehabilitation and support if the damage was inevitable or has already occurred. Regular audiological monitoring also provides an opportunity for audiologists to counsel patients and their carers regarding drug-induced hearing loss, early signs of ototoxicity like tinnitus and dizziness, improving their communication strategies, and the fact that exposure to noise or other ototoxic drugs have synergistic effects and therefore increase the risk of ototoxic damage. Table 1: Examples of established ototoxic drug groups. Ototoxicity monitoring protocols In general, baseline assessment (or within the first 24 or 72 hours of first dose of cisplatin or aminoglycoside respectively) followed by regular serial monitoring throughout the patient’s treatment, and then post-treatment monitoring for late-onset ototoxicity, is the main outline for an ototoxicity monitoring protocol to allow for each patient to act as his / her own control. Figure 1 shows the recommended monitoring protocol proposed by the American Speech and Hearing Association for patients with cancer receiving ototoxic anti-neoplastic drugs (guidelines available from http://www.asha.org/policy). Clear behavioural / objective assessments change criteria need to be identified to confirm presence of ototoxicity, and to set limits to when a change in treatment regimen needs to be applied. What is the aim of monitoring? Is it early identification to prevent further damage or identification in order to help improve quality of life by implementing rehabilitation plans and counselling services? Who is your target population? Is it a young adult group with cancer that has never been exposed to ototoxic drugs before and has relatively normal hearing / balance function; or young children with cystic fibrosis who have been receiving aminoglycosides to combat their chest infections, probably since birth, with multiple comorbidities that significantly exaggerates the cumulative ototoxic effects of these drugs; or are they elderly patients within an intensive care unit being treated for severe infections or cancer, who already have evidence of noise-induced hearing loss and presbyacusis? Are they responsive / non-responsive? What other risk factors are associated with your target population? Extremes of age, poor renal function, exposure to head and neck irradiation, noise, other ototoxic drugs, distorted metabolism, and certain genetic abnormalities are all factors that increase susceptibility to ototoxicity. How can you best identify and reach your target population? Good links with the key managing doctors, nurses or pharmacists is essential. What are the most appropriate audiological assessment tools and timelines that can be used ? Will your target population be able to undergo repeated behavioural testing on a regular basis during and after their treatment? Or will they be unwell at different times so that only quick objective tests such as otoacoustic emissions are more effective on these occasions ?Extended high frequency audiometry allows for early detection of hearing loss, but for very young children (five years and under) the test-retest reliability is not sensitive enough. What are the acceptable sensitivity and specificity levels of each of the tools used that can allow for the least number of misses or false positives? What is the most suitable assessment location that can allow for repeated testing with the least impact on test-retest reliability? How much will this service cost? Equipment, staff, facility, training costs and more should all be factored in to confirm that the monitoring programme is affordable and feasible. Figure 2: Responses obtained by the oncologists regarding the actions they will take if ototoxicity is confirmed for their patients following exposure to ototoxic drugs such as cisplatin. Addressing these questions and others is essential in order to set up an effective and customised ototoxicity monitoring service for the patient groups you will be caring for. Current practice in the UK. At the UCL Ear Institute, we performed several online surveys to assess current practice in monitoring and management of ototoxicity. We received combined responses from 378 clinicians ranging between audiologists, oncologists, ENT, audiovestibular physicians, and cystic fibrosis physicians. Their responses show that there was a relatively high level (70%) awareness of the existence of ototoxicity and the need to monitor for it; but it also clearly showed that there was a large variability in the degree, type, protocols used for ototoxicity monitoring and also for the management options available for dealing with patients identified with ototoxicity. Seventy-one percent of the audiologists stated that they did not have / didn’t know if there was a protocol used in their service to determine what audiological tests to use and timelines for monitoring; and 69% of the clinicians said that they would refer patients for audiological assessment only when they start complaining of a hearing / balance problem, instead of following a pre-emptive monitoring protocol. Around 50% of both audiologists and clinicians confirmed that baseline assessment before the start of the ototoxic medications, is not performed. Most of the respondents indicated that standard audiometry is the main assessment used to monitor hearing status, with only a few confirming that more sensitive testing, such as high-frequency audiometry or DPOAEs, are used to detect early signs of ototoxicity. When asked whether counselling is provided to patients regarding ototoxicity, 69% of the clinicians said that they did provide this but on further questioning many of them indicated that this just constituted part of the consent before starting the medication and that patients were only told that their hearing may be affected with no further information provided. On the other hand, 76% of the audiologists stated that they were not involved in counselling the patients at all, with some of them stating that they believed that this was the “managing doctors’ role” and not their responsibility, despite their expertise in knowledge regarding the diagnosis and rehabilitation for this condition. 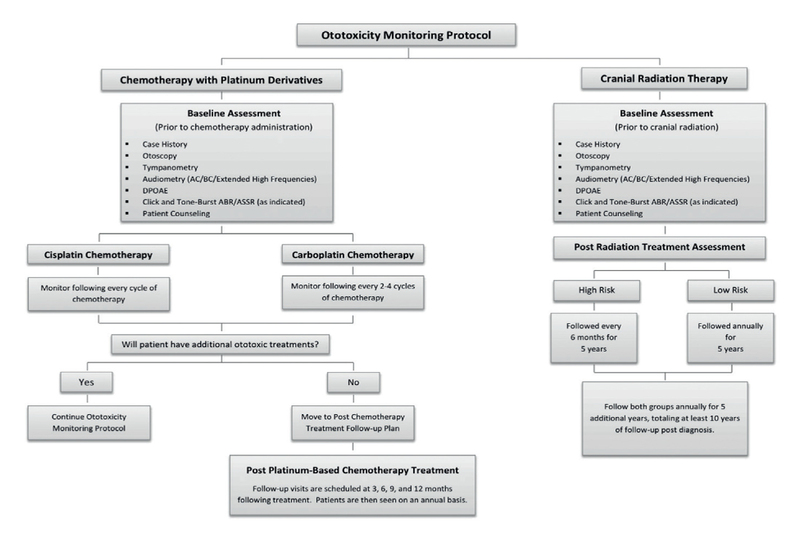 Figure 2 shows the responses of the oncologists regarding the different management options they would undertake if ototoxicity was confirmed for their patients. There was very limited confirmation that balance function was assessed when considering ototoxicity, with the majority of respondents verifying that only hearing status is monitored. Always remember that prevention is the best form of rehabilitation, and that audiology professionals are in the best position to lead on establishing effective ototoxicity monitoring programmes (See the American Academy of Audiology Position Statement and Clinical Practice Guidelines Ototoxicity Monitoring, 2009). Establish better links with healthcare providers (clinicians, nurses, GPs and pharmacists), to establish clear referral routes, monitoring intervals and criteria for ototoxicity to address a clear aim for ototoxicity monitoring. Set up national UK standards for ototoxicity monitoring and management through a consortium of experts e.g. via links with the BSA / BAA, ENT UK, Royal College of Physicians / Nursing / Radiologists, to allow for consistent service provision throughout the country. Preparation of patient information leaflets or online information to provide evidence-based, clear information to patients on types of ototoxic drugs, early detection and management of ototoxicity etc. There is extensive research and some clinical trials investigating possible otoprotection agents for the effective prevention and restoration of hearing loss from ototoxicity: having established ototoxicity monitoring programmes will aid in delivering these otoprotective drugs to patients when they become clinically available. In conclusion – ‘Are we doing enough?’ The answer is NO! We can do so much more for our patients. Knight KR, Kraemer DF, Winter C, et al. Early changes in auditory function as a result of platinum chemotherapy: use of extended high-frequency audiometry and evoked distortion product otoacoustic emissions. Journal of Clinical Oncology. 2007;25(10):1190-5. Reavis KM, McMillan G, Austin D, et al. Distortion product otoacoustic emission test performance for ototoxicity monitoring. Ear and Hearing 2010;32:6174. 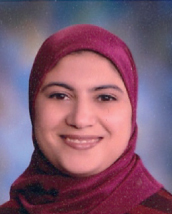 Dr Al-Malky is a medical doctor specialised in audiovestibular medicine since 1996. She moved to the UK in 2000 where she worked in the NHS for several years before taking up an academic role at the Ear Institute, UCL. Her research interests include: translational research on ototoxicity aiming at bridging the gap between laboratory auditory biophysics and genetics research and clinical applications in human patients. One of her major future aims is to establish collaborations to enhance the role of the UK audiology profession in the provision of ototoxicity monitoring and to help establish UK guidelines and standards of care for the management of patients with ototoxicity. Castle Hearing was granted permission to use this article by ent and audiology news, visit their website for more interesting related articles by clicking here.